The last time a high school golfer shot a course-record 62 in Southwest County, he went on to good things. His name is Rickie Fowler. A little less than 12 years ago, Fowler’s high school coming-out party was in the CIF-Southern California Regional at The Golf Club at Rancho California, when he won with a then-course record 62. Norman Xiong could be starting on a similar career trajectory. The Lake Elsinore Temescal Canyon junior tied Canyon Lake Country Clubs course record Monday, shooting a 9-under-par 62 to win the annual Titan Invitational by four strokes. Murrieta Valley won the team competition with a score of 14-over 369. Xiong, the University of Oregon-committed fourth-place finisher from the state championship from a year ago, scorched the front nine at the par-71, 5,883-yard track. The fourth hole, Xiong said, is where he knew something special was going on. 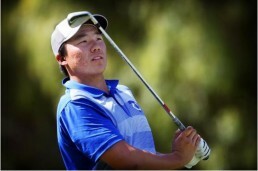 Xiong, whose home course is Canyon Lake, trusted his KBS Tour V 125 in all Irons and KBS Hi Rev 2.0 135x in all wedges …. Good luck to Norman on his already bright future! !